In 2011 during the conflict St Barbara Foundation was asked by the National Transitional Council of Libya to support Libya in the clearance of mines and ammunition. The Foundation had previously advised Libya on the set up of a mine action center and assisted in dealing with Second World War anti-tank minefields. Through a grant by the German Federal Foreign Office the St Barbara Foundation was able to implement several humanitarian mine and ordnance clearance projects in different regions of Tripoli, in the Nafusa Mountains and in Souk El Ahad, for over 2 years. 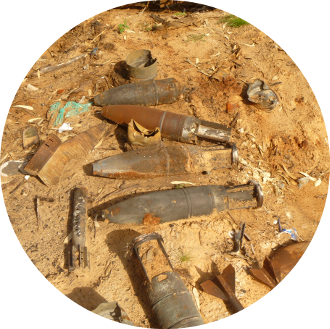 The clearance of ERW (Explosive Remnants of War) has helped to avoid accidents and to restore normal living conditions. Abandoned explosive ordnance was secured. The cleared areas could again be used for agriculture and livestock farming and thereby ensure the families livelihood. Some thousand mines and ERW on an area of several hundred thousand square meters have been removed. Local employees were trained in different areas, the local NGO „Free Fields Foundation“ was supported.